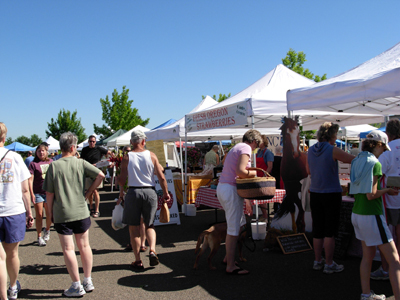 On Saturday, I visited the Oregon City Farmers Market. I had first enjoyed the year-round volkssport walk from Willamette Falls Hospital with my walking buddy Nona and her four adorable dogs. We left the pooches at her house and went in search of local food. I found plenty of strawberries (local) and cherries (from Central Washington). For my purposes, Yakima Valley fruit was local enough and I bought a pint of Rainier cherries. At another booth, I bought local carrots and garlic stems. I’m not sure what I’ll do with the garlic stems, they seem best suited for adding to stir fry or soup. I think I might end up freezing them for future use. I also bought beets and a couple nice heads of hydroponic lettuce. Altogether, a very good shopping stop. As the season is gearing up, there is more produce selection.